BRAINWAVZ is not exactly a household name like Sennheiser or Bose, so you may not have come across them before unless you’ve read our site for a while. They make a plethora of audio products to please all ears ranging in price and quality. 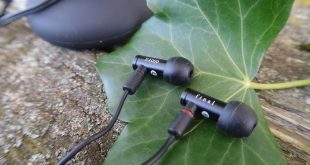 The BRAINWAVZ BLU-100 Earphones are at the lower end of the price range, offering functional controls and a versatile design along with a pretty good and well rounded sound. On top of this BRAINWAVZ offer a 24 month warranty on all products in the range giving you confidence in the brand to deliver. 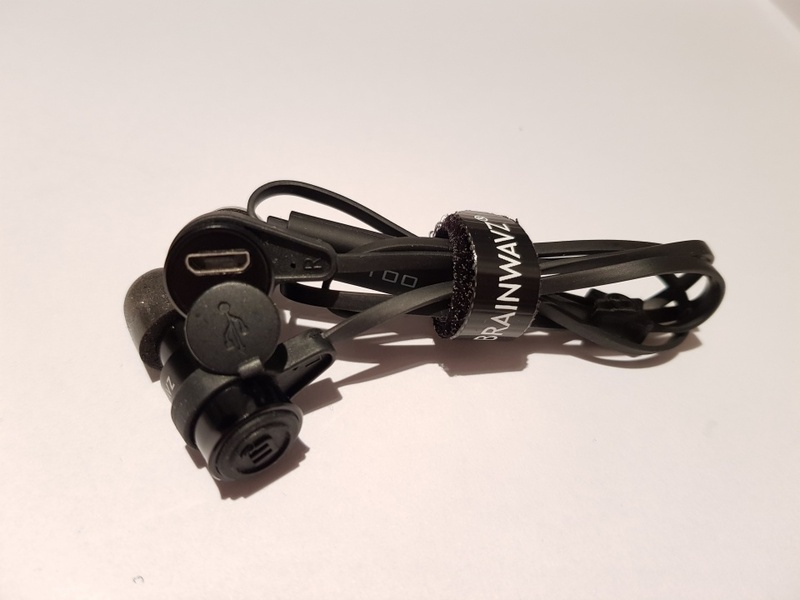 So if you’re looking for a great set of Sport Bluetooth Earphones without having to sacrifice audio quality, the BRAINWAVZ BLU-100 Bluetooth Earphones could be for you. 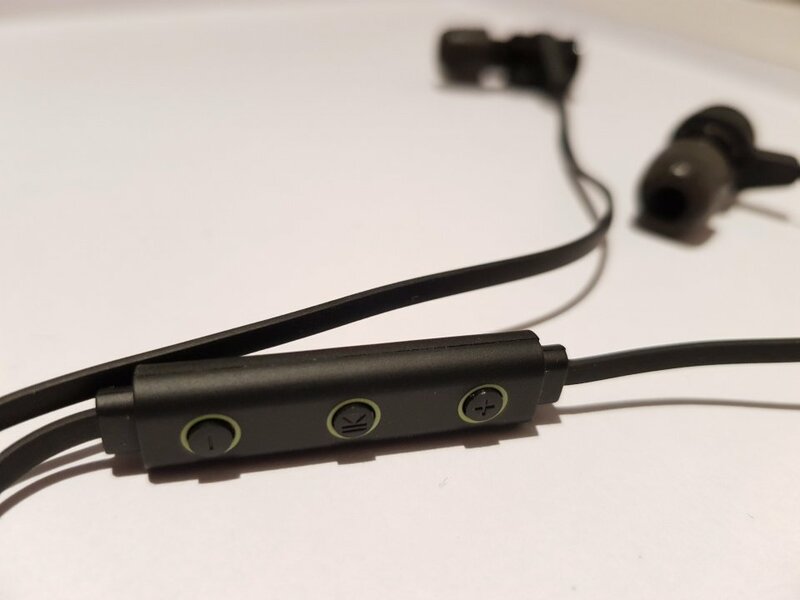 Over the past few weeks I have had a chance to put these earphones through their paces to give you a good idea of how they perform in the real world and have enjoyed doing so. 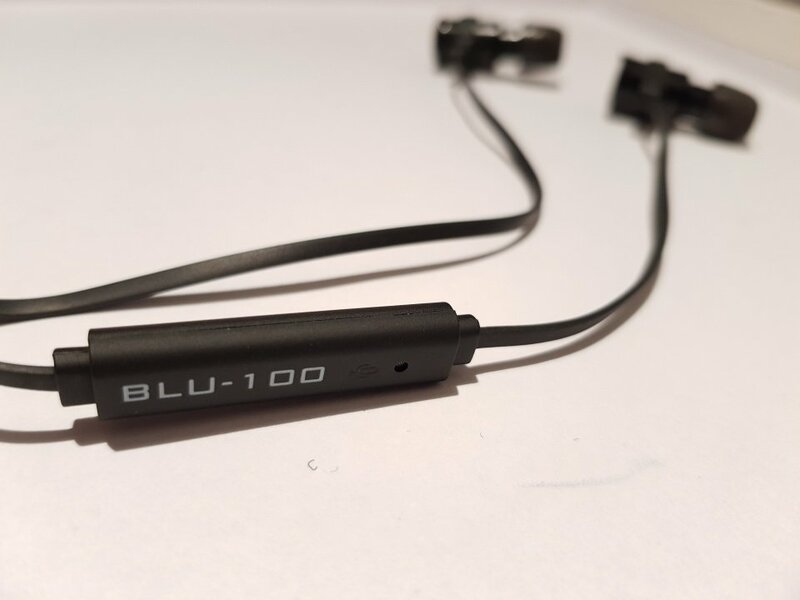 The BLU-100 Earphones have a subtle look, they are primarily black with some green accents giving them a discrete look rather than, for lack of a better word, fancy. 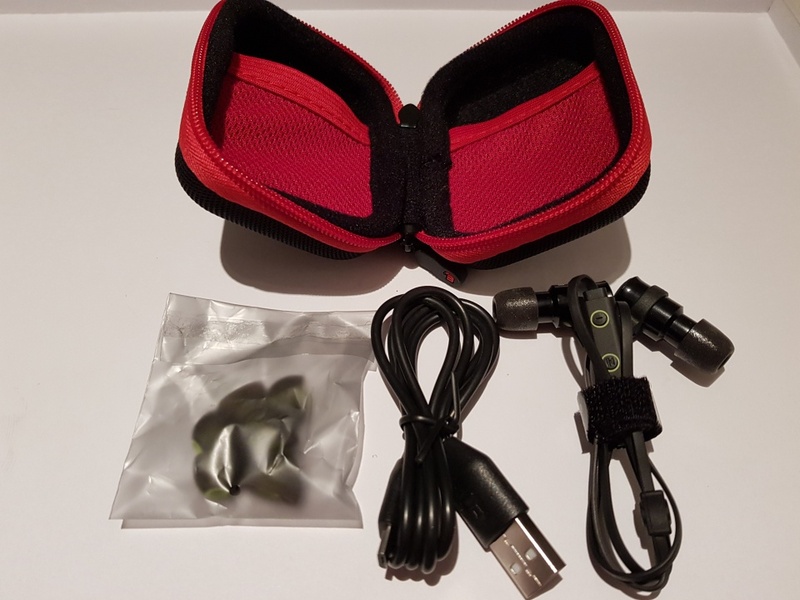 What does stand out is the handy little case they come in which looks fantastic, holds your earphones, charging cable, set of different sized rubber ear tips and a small Velcro binder to hold the wires together keeping it all neat and tidy. All of these little touches give the BLU-100’s a feel of value beyond the £34.50 price-tag. The buds themselves are a little bulky for my liking and tend to hang out of your ear a fair bit and droop down due to the weight of the earpieces and cable. That said the 3 different size options of tip plus a memory foam set that comes with the earphones give you excellent choice of fit and they do tend to hold in your ear rather well (I went for the foam tips that molded to my ear perfectly). Stemming from the earpiece runs a flat anti-tangle wire with a small plastic adjusting zip to pull them up to the back of your neck for a snug fit, personally this was a pain. I used these earphones while in the gym and every time I turned my head it pulled the already heavy buds out of my ears. So I went for a more original look having the wire at the front hanging it down into my shirt giving me the freedom to twist and turn to my hearts desire without disturbing the balance of the buds. To finish off the 3 button control unit on the wire has a strong feel in general although the buttons do feel a tad cheap it doesn’t harm the functionality and they performed well during use. The controls are simple to use and easy to access with your hand while your doing your workout / going about your day. The only thing that stood out here was the skip song ‘beep’ which tended to be louder than my music and really hurt my ears when listening at high volumes making me lean towards fiddling about unlocking my phone to skip tracks. For a budget set of earphones the BLU-100’s have a good all round sound experience. The Hi’s and mid tones sound excellent and give a great deal of clarity to sounds of guitar and vocals. Unfortunately the bass is not as good. It still delivers a decent sound for Rock / Pop music and gave a well-balanced audio experience but if you’re into your bass lines or hard drums you may be disappointed. It lacks depth and really disappointed me in some songs where bass is key. While on this subject, I found with my phone that some of the songs were a little top heavy especially on live tracks but after an adjustment with the equalizer they balanced out perfectly. 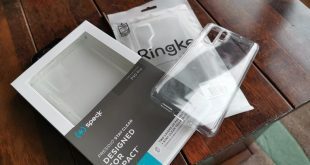 The pairing was pretty standard and simple as was charging the earphones with the easy access point located on the right earpiece and charging from flat will take somewhere around the 2 hour mark. The 4 hour battery life when seemed to be relatively accurate to BRAINWAVZ description falling between 3.5-4 hours depending on standby time and time between use. While I found this to be ample time for me given my 1-2 hour gym sessions I did find myself charging them between just in case. Ideally this would be a little longer but you can’t knock BRAINWAVZ for packing that battery life into a relatively lightweight set like this when given the price range they fall into. Here is a list of the technical specifications directly from the BRAINWAVZ website for all you tech guru’s out there. 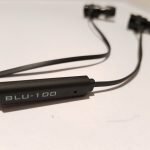 As an everyday set of earphones for the avid user I would go for a wired set but for the gym and other fitness activity’s the BLU-100 Bluetooth Earphones are an excellent choice. Although you may be running back to the charger after a few hours of use. For the £34.50 price tag you can’t go wrong with this set and will be pushed to find a better quality set especially from the larger brands. A well rounded sound and good fit along with the plethora of accessories gives an incredible value for your money. I would like to thank BRAINWAVZ for sending me the BLU-100’s for purpose of this review. Lover of Gadgets, Games, Media and basically all things Tech.